Diamonds are the most adorable and elemental part of jewelry from generations. They are quite expensive and have remained popular throughout the years. Diamonds represent the social and economic status, success and sign of love. These gemstones are mostly used in decking up of engagement rings, bangles, necklaces, earings etc. They have been the most significant adornment for women since ages. TheRoyal family in the ancient history used to wear diamonds like, Kohinoor and Cullian which are very expensive in nature. Infact the Romans considered diamonds as the particles from falling stars and the Greeks believed them as ‘the tear of God’. These diamonds acquired its name from the Greek word ‘Adamas’, means unbeatable. Diamonds are the most relevant stones for various occasions. Both gender wear diamonds which further contributes their outstanding reputation. Diamonds are mainly famous as engagement rings. It represents the symbol of love and commitment. It is believed to be directly connected with the wearer’s heart which controlls the emotions. Besides engagement rings, diamonds can be bought as pendants, earings, bangles etc. These precious gemstones when gifted to their partner, specially the women, as an anniversary gift, birthday gift or any casual gift, enhance an intense exhilaration. In our modern society, women wear jewelies pairing up with their dresses. Their beauty get more glorified and in turn built more confidence in them. Women dressing up themselves with jewelries are not only a customary tradition but also several values have been attached with each and every piece of jewelry worn by them. 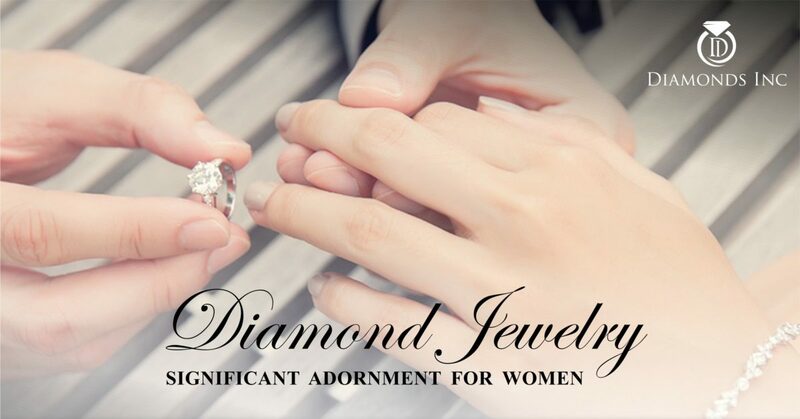 While choosing a diamond jewelry for the loved ones, one need to think about her taste. This is because these precious gemstones represent the personality of a person. These diamond jewelries are very popular as they are durable in nature and have noteworthy physical characteristics. Thus, while buying a particular jewelry from these online stores one has to check its cutting, colour, carats, clarity that is the 4C’s of Diamond charateristics, along with its style and certification. Buyers should have knowledge about the properties of a diamond from before hand so that he or she doesn’t get fooled. The ideal colour of a diamond is colourless and graded as D, E, F. But this type of diamond is very expensive and rarely found in nature. That is why, people go for the coloured diamonds like yellow, white, blue, pink which are less expensive compared to the colourless one. These are graded as G, H, I. According to the choice of colour, one has to make a decision while purchasing for his/her companion.These gemstones have various shapes according to their cuts. Mostly the classic round shaped diamonds are purchased. It is a very common and popular shape among other shapes of diamond. But if one is thinking of presenting something extraordinary to their loved ones then there are different shapes available in the market. Each and every diamond shape possess a unique property. The shapes that are mainly available in the stores are Princess Cut Diamond which reflects an unique colour from its center and corner, Marquise Cut Diamond, Cushion Cut or Pillow Cut Diamond, Radiant Cut Diamond, Pear Shaped Diamond, Oval Cut Diamond. Since every diamond shape is cut into various particulars, they reflect light in an unexpected way, giving each shape an exceptional fire and splendor. One can also discover the precious stone studded rings, pendants, wristbands, and bridal accessories in the online jewelry outlets. Otherwise can easily walkin to the stores. Diamond mines are not generally found in every country. However they are not rare or exceptional. These precious gemstones are present in about 35 countries. Russia, Botswana, United States, Canada are the some among them. Alrosa is the famous diamond mining, manufacturing and trading company present in Western Yakutia, Russia which is the world’s largest diamond producing nation. Historic Jewelers Row in Chicago is famous for manufacturing and trading of self-made diamonds at a wholesale rate. The largest diamond markets in the world are India, Belgium, the UAE, the USA, Hong Kong and Israel where trading of natural rough diamonds are the center of attraction. Diamonds are considered a girl’s best friend and are the perfect gifts to show one’s eternal love, care for someone special. Each and every diamond has its different unique meaning in them. It not only defines and enhances the beauty of a woman but brings a lot of joy in them when gifted.